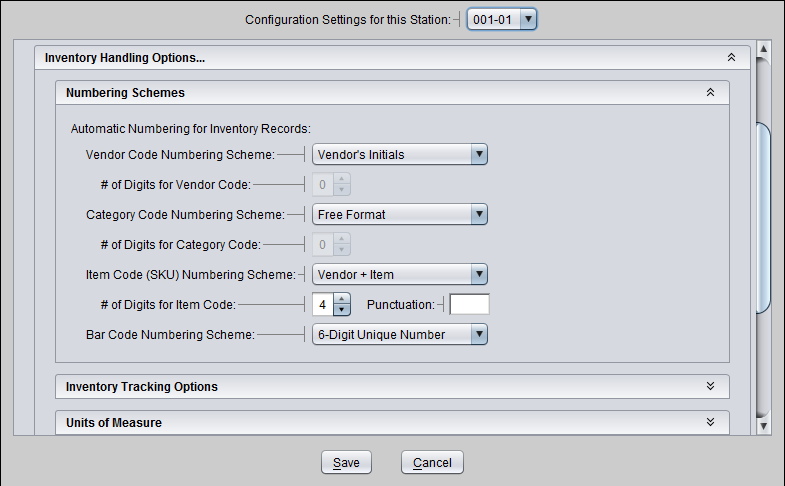 The following fields allow you to have the program automatically generate unique codes for new Vendor, Category, and Item records. Even with automatic numbering, you can still type in your own codes instead of the automatic suggestions (either before or after they are assigned). You will, in any case, be prevented from entering duplicate codes. It is important that you establish your item code numbering prior to printing merchandise labels! While it is easy to change the number schemes in Artisan at any time (Artisan can even update your existing records), it can’t re-tag all your products for you if they have the wrong codes! This setting determines how (or if) automatic vendor codes are generated. Select between Free Format (you type in whatever you want) and automatically created vendor codes.The default setting creates an alphabet based code derived from the vendor’s name. You can also choose automatic numbering that is based on a sequence number; see below. For numbering schemes based on a numerical sequence number, enter the number of digits to use to generate vendor codes. This field is disabled until you select the numbering scheme based on a sequence number from above. All codes in Artisan are text character based, not numeric. That means that the program considers “001” and “01” to be different. Therefore, when searching for items with leading zeros you must type in all the leading zeros. It also means that you must be careful when designing your numbering schemes. You should allow plenty of growing room (extra leading zeros) for item codes. While you can add codes with more digits later, it’s better not to use two digits if you expect you will ever have more than 99 items for that particular pattern. If you choose scheme #9, a simple sequential number, don’t use Bar Code Numbering (or at least use a different number of digits), to avoid conflicts. If you’re using an item numbering scheme with multiple components (for example, “Vendor Code + Vendor’s P/N”), you can optionally enter 1-3 punctuation character(s), such as a dash (“-”), to place between the components. If you choose not to use automatic numbering, you can still create codes that contain sequence numbers to make them unique, by using wildcards. You can place wildcards (a string of asterisks) anywhere in an Item Code, Category Code, or Vendor Code (or the unique key field of any other type of record), and Artisan will replace them with the first available string of numbers that make the code unique (starting from the number one, with leading zeros). For instance, say that you want all objects that you’ve placed in a particular display case to have a prefix of “DC” followed by a unique number. When you’re creating a new item record (or editing an existing one) you could type “DC***” in the item code field; after you pressed Enter, the asterisks would be replaced with the sequence number, so the first such item code would now be “DC001”; the next would be “DC002”, and so forth. It is very important to have a unique identifying code for each different item in your store and the same is true for vendor and category records. When you are running a station remotely, you run the risk of creating new records with the same code at both locations, since there is no live connection to check for duplicates while you’re entering them. To help prevent you from doing this, automatic numbering for Vendor, Category, and Item Codes is normally turned off on remote stations, since the automatic schemes are sure to generate the same number. However, if you generally create new inventory records on a particular remote station and don’t create them elsewhere, then you can use this field to allow automatic numbering on that specific station. Whenever that station is remote, automatic numbering will be disable on all other stations, even at the main location; other remote stations will always have automatic numbering disabled. If you print merchandise item labels from Artisan, the Item Code (SKU) for each Item is normally used as the bar code, too. This can sometimes be a problem when you have long Item Codes and small labels. For this reason, Artisan will use the code in the Item’s Alt Code 2 field instead, if it’s not blank. To make it easier to come up with (shorter) codes for Alt Code 2, you can use the automatic Bar Code Numbering Scheme. This will automatically assign a unique number to Alt Code 2 for all new Item Records, unrelated to the Item Code. You can choose to use 5-, 6-, or 7-digit numbers. 6-digit numbers should fit on even the smallest labels; 7 digits might be tight. When you first turn this option on, you’ll also be given the option to assign codes to all existing Item Records (except those that already have values in Alt Code 2). Special Note if you’re using Product Variants: Bar codes will be assigned to Variants as well as Base Products, but only to those with individual inventory tracking turned on. Special Note if you’re using variable-measure bar codes (a.k.a. random-weight UPC codes), typically from scales or fabric measurements: These codes are based on 5-digit product codes, so if you aren’t using the 5-digit codes as your Item Codes, you can set Bar Code Numbering to 5 digits, and it will assign unique product codes for you. This field holds the number for the next Bar Code number to be assigned, if Bar Code Numbering is turned on. You can change this from the default if you need to skip certain ranges (to avoid conflicts with Item Codes; or to use different ranges for different stores, when you’re operating independent stores with inventory transfer instead of using the Multi-Store feature).